So, last week my mom called me and asked if I would go with her to the cosmetic’s store and help her find some new lipstick, something about not having the right shade or running out, I forget. Now, my mother is a very fashionable woman. She knows how to choose her own lipstick. But, I wasn’t thinking about that at the time. I thought, “Sure. Helping mom find some cute lipstick should be fun”. Moms have a way of knowing exactly what you need before you do. I’ll admit that “beautifying myself” hasn’t been on the top of my “To Do” list in quite sometime. It left somewhere between dirty diapers and late night feedings, but I will admit that I feel FANTASTIC when I’m wearing something that makes me feel good and why shouldn’t we feel fantastic everyday? I’ve been thinking about starting a style segment on this blog for some time. There are lots of style blogs out there and this is not a style blog per say, but I hope you consider it to be a blog with style. I thought it would be fun to put some outfits together as I make them, (kid style included) and show you how we wear them down here in Atlanta, GA. (Woot!) I don’t know about you, but sometimes a little motivation (or a good kick in the pants) is just what I need to help me refocus and place myself somewhere in the fashion equation. Sewing for myself feels really good. And feeling good, feels REALLY good. And now to SKIRT WEEK! My friend bloggers over at Crafter Hours, Adrianna and Susan (Remember Susan from my Moms Know Moms series?) 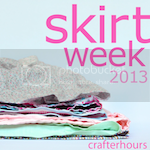 , are running another fun Skirt Week. Today I’m sharing with you my Ladder Skirt and Tutorial. I love texture, that’s why I’m so hooked on making these puzzle-like skirts. Remember this one? It’s probably as close as I’ll ever get to making a quilt. Ha! Ha! (I think my crafty gene might end at clothing. LOL, but you never know). I’m usually not a jean skirt person, but I’m lovin’ how this one turned out. They are easy to make and each one is different. I love that this type of design will work on any type of skirt, A-line, straight, wrap, maxi, you name it. It just depends on how you divide your pattern piece. You can buy your fabric, but I just thrifted some old jeans that I was going to throw away (holes in the knees). Now I feel extra special because I did something great for the environment, too. 🙂 To complete the look, I just threw on a men’s white shirt, some pearls and some Anne Klein sling backs to pull everything together. Not the most practical outfit for a trip to the grocery store, but hey, I felt good! And, joy of all joys, I got my husband to take my pics this time. I usually grab one of my older kids, but I’ve been asking them to take pics so much lately that their eyes are starting to glaze over. I thought it might be time to bring in “The Professional”. He’s awesome. Here he is explaining to me the importance of location, and the sun, and shadows, and ummmmm . . . . Well, I got lost for a second, but that’s okay because he’s really nice to look at. The Ladder Skirt Tutorial download can be found here: The main focus of the tutorial is to show you how to piece the front panel together. I do a quick “how to draft a straight skirt” but it assumes that you know the basics of putting one together. If you’ve never drafted your own straight skirt and need some additional guidance, here are a few great online links that will give you the Step by Step instructions. I’ve included a “mini” video below to help with some of the steps. I make note of the video on the PDF. Also, don’t forget to sign up for our free monthly newsletter to take advantage of discounts, give-a-ways and free patterns. You can sign-up here. Previous articleFree Pattern until May 31st. Beautiful! It’s such a stylish look that looks great on you. I love the dimension to the things that you’ve been sewing for you. Oh, and you’re a homeschool mom — isn’t there a rule that you have to like jean skirts? LOVE IT! So pretty!! Thank you! Yep, the hubs is pretty good at taking those “unwanted” photos. He thinks they’re pretty funny. As soon as he hears, “Wait don’t take the picture, yet”, that’s pretty much his clue to take as many photos as he can. Lookin’ good, my friend! You really rock this style! Love the story about your mom tricking you into getting something for yourself…too cute. Sounds like a lovely lady as are you! Yeah, my mom got me pretty good. I didn’t see that one coming. Ha! Ha! Ooh, you have a style blog, Stacy? Of course you know that means I’ll have to find it now, right? I think personal style is absolutely the best. It says so much about who we are. Already visited and left you a comment! Thanks, Stacy! I love it! Thanks so much for sharing! And an easy-on-the-eyes photographer is always a good thing! Thanks for the invitation Susan! Ha! Ha! Ajaire, I was thinking the same thing after I saw that walking shot. I was like, “What happened to the front view?” I’m glad it made you smile this morning. Ha! You are an absolute riot Shannon! Oh, you had me over here hollerin’! Lol. This post is great. You had me with the white shirt and pearls. I think it is so fun to add a little quilting to clothing items, and you did a great job on the skirt. Love that sassy pic of you walking away too. The photo shoot was a lot of fun. (It was hot outside and I was starting to sweat, but other than that it was a lot of fun. Ha! Ha!). I’m gonna have to bake you some virtual cookies for that comment Tracy!!! Ooh, virtual cookies for you, too, Louise!!! Shannon!!! I LOVE this one…and you look GREAT in it, wohoo! Wow you look fantastic! Love the last photo. Fantastic! I found my way here from Craft Gossip. Think I’ll stay!! I’m thinking that you piecing pattern would look wonderful on a dress. Will let you know how it comes out. Hi Becky! Welcome, and yes, please let me know how the “puzzle pieces” turn out on a dress. Cute! Cute! Ha! Ha! You make me smile, Adrianna! Thanks! Just found you today…already subscribed. You go girl! Great photos of you Shannon. You should always have your husband take them!